To get started, sign up for a Scout account here. You will receive an email asking you to confirm you email address. If you do not receive your email confirmation, please check your spam folder. Click the "Confirm Account" button or the copy and paste the link provided into your browser. 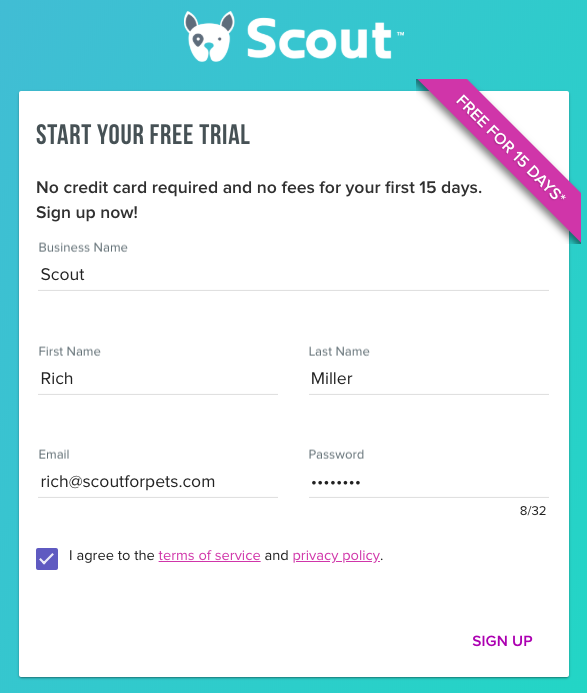 Once you confirm your account, enter your email address and password to log into the Scout system. Upon logging in, you will be prompted to complete a 6 step setup process. During Step 5, Scheduling, you will be asked to choose a scheduling preference, Time Blocks or Specific Times. For more information about setting up time blocks, click here. After the initial setup process, you are encouraged to set up a test customer. Use a different email address than the one you used to sign into the Scout system. You will want to use an active email address. To create a free email address using gmail, click here. For more information about creating a new customer, click here. Congratulations! You're account has been set up. We have created in depth documentation to help you get started using the Scout system. Click here for our "Using the Scout System" documentation. For help with your business settings, click here.